A new blog launched it's first challenge this week. The site is called Treehouse and it will set a different colour challenge each week on a Thursday. I have also used last week's challenge sketch from Stamps And Smiles - I've been meaning to do this one all week, better late than never eh? :o) Again, this sketch appeals because of it's simplicity. All the products are Stampin' UP! except the image stamp and the large flower punch used. oh my. Teri. The image is so , super ,cute!! I adore her. and you once again knew exactly what do do with her. It's a real beauty! What a beautiful card with such a lovely image, I can remember that stance so well!! Omgosh what a darling image and your coloring is fantastic, I love it. Great job on this color combo so glad you had a sub for baja. 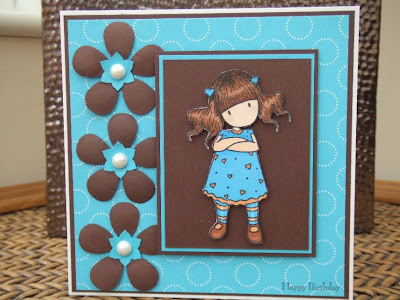 Hi Teri, what a gorgeous card i love the colour combo, Thankyou for hopping over to our new Die Cut Dreams Challenge blog Hope to see you there for the first challenge on the 15th June. Winter Wonderland - #5 Christmas Crackers! Winter Wonderland - "A Christmas Carol"